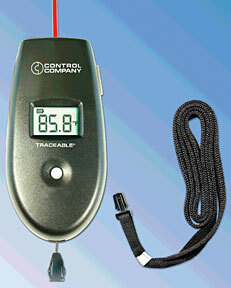 Traceable®, Digital, Probe, Infrared and Analog Dial Thermometers. All read in Fahrenheit and Centigrade. 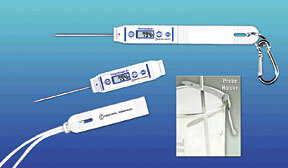 With optional Low Temperature and High Temperature Probes. Easily switch between Fahrenheit and Celsius. The LCD can be flipped to give the best angle for viewing. The LCD is large and easy to read. Data hold is incorporated for hard to reach areas. Auto power off saves battery life. Range: 58° to 300°F or 50° to 150°C. Waterproof, shockproof, stainless steel sensor probe, min/max memory recall, F/C selectable, low battery indicator. 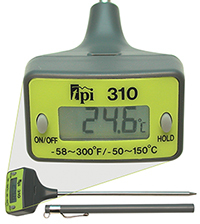 -50 to 300°C, -58 to 572° F. Accuracy ±1° from -19.9 to 199.9°C. Stem length is 10.75. Comes with stem cover. 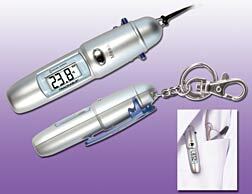 Simple and versatile thermometers for most laboratory applications. 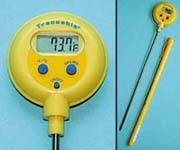 These partial immersion thermometers offer an environmentally safe non-toxic red filler. They come with either a white or yellow background and can have a dual scale of Fahrenheit and Celsius or Celsius only. The scale covers -20°C to 110°C or 0°F to 230°F. 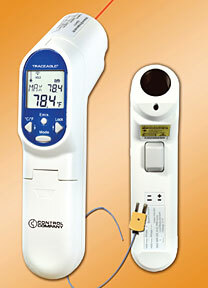 All thermometers are 12" (30.2cm) in length and include an anti-roll device for safety. Sold in packages of 2.